Last week, I had the opportunity to attend the SHAV (Speech-Language-Hearing Association of Virginia) Conference with my classmates. 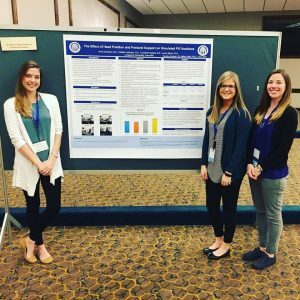 This was the first of many professional conferences and conventions I will attend throughout my career as an SLP, and I am so happy to report that it was a wonderful experience. I attended several lectures on topics including dysphagia, language disorders, and professionalism in externships and beyond. I was able to connect with SLPs I already knew, as well as network with other SLPs and students in the exhibition hall and student social. At the end of the second day of SHAV, my classmates and I presented our research posters, which we had begun to prepare for last fall. There was a lot of work involved in the research itself, and it was a proud and accomplished feeling to confidently present the results to judges, SLPs, and other students. I am very grateful for this opportunity, and for the glimpse into the professional world I am working toward.